Let us calm the body, spirit & mind. Our energetic vibration is dampened when we hold onto trauma, grief, anger... and we may end up feeling stuck physically, emotionally, mentally and/or spiritually. Let us have compassion, joy and love for ourselves, release unwanted patterns and live life fully! Reiki is safe and natural, and treats the Whole person. This gentle, hands-on energy healing technique radiates love and light into the body, mind and spirit. 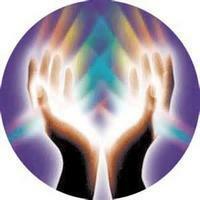 Reiki helps create harmony between the emotional, physical, mental and spiritual bodies. With permission from the client, I will gently place my hands at different points above and on the body to encourage a clearing and balancing of the aura (outside the body), and the energy centers, know as the chakras (inside the body). . Our positive intentions will promote relaxation, release, empowerment., healing, and self-improvement, More Info. Sound Healing is an ancient sonic technique where the vibrations from sound, help clear, activate and ground the energies in the body, mind and spirit. It helps open and expand the consciousness by slowing down the brain waves, and allowing you to relax deeply. The crystal alchemy Singing Bowls are used around and on the body and the Voice, through toning, chanting and mantra may be used to further your journey of release and empowerment. You may be asked to use your Voice during the session, to deepen your healing experience. For ultimate comfort, you will be fully supported on a massage table. Sound Baths are offered to those who are interested in a deeply relaxing, sensory experience. The Sound bathes the Whole being, allowing the receiver to feel the healing vibrations of the Alchemy singing bowls while lying, fully supported on the floor, or in any comfortable position of your choosing. If you like, bring favorite items for creature comfort (blanket, pillow) and intentions of what you'd like to release, restore, and/or bring into your life. Earthtone can accomodate private and couples Sound Baths, for a blissful, healing sound experience. Share the Love with a Soul Mate or family member. By arrangement, Sound Baths can accompany private events, yoga classes and healing ceremonies.. In the comfort of your own home, I will connect with you on the energic level, through the healing modality of Distance Reiki. I will guide the calm, healing Reiki energy to you, wherever you are in the world. We are all connected on a very deep level, and the Universal energy that surrounds all of us can be tapped into anytime, and anywhere on Mother Earth. On the day and time of your session, I will call you and we will talk about how you're doing that day, and if you have any questions/concerns before the session begins. After we finish our conversation, we will hang up, and I will connect you to the Reiki energy. You will receive the healing energies of love and light wherever you may be resting. Sessions last around 45 minutes, and it is common to talk over the phone after the session is complete. More about Reiki. It has been my absolute pleasure to work with cats, dogs, rabbits and horses on the energic level, through the healing modality of Reiki and Distance Reiki. Animals love Reiki and I have received much Love from the animals in response to session, and positive results. Energy work is encouraged for all animals, especially those that have had challenging circumstances in their life, are ill, in chronic pain, and/or need support post-surgery. Distance Reiki may be preferred to those animals that need a special approach to healing. For a Distance Session, the Beloved animal's care taker will choose the location, best suited for the animal to relax and feel the healing love and light of the Reiki energy with minimal to no distractions. Please allow up to 75 minutes for communication and session time. On the day and time of your session, I will call you to talk about how your Beloved animal is doing that day, and if you have any questions/concerns before the session begins. After we hang up, and I will connect the Reiki energy to your Beloved. It is common for the animal to move into a relaxed body and slower breath pattern. Interested in a hands-on Reiki session for your Beloved animal at your home or stable? Please contact Maria directly about this possibly.